Dave Brubeck has just released Time Out, Ornette Coleman brings out The Shape of Jazz to Come, Coltrane with Giant Steps, Miles Davis releases what we now know as the seminal best selling album in jazz history, Kind of Blue, Mingus releases Ah Um and it’s all happening in 1959. What else can co-exist to what are already pivotal entries into the history of jazz music? A saxophonist from Aldgate, Ronnie Scott, will open his small jazz club with fellow musician Pete King at 39 Gerrard St. It will be a turning point in British jazz and an opportunity to bring American jazz onto British soil. Following the success of lifting a Musicians Union restriction on allowing American jazzmen to play in the UK, the club played host to Zoot Sims in a four week residency at the club in 1961. This opened the floodgates to a musical exchange that made Ronnie’s the first club to offer bookings to American Musicians. Johnny Griffin, Benny Golson, Stan Getz and Sonny Stitt entered the doors, soon followed by Donald Byrd, Art Farmer, Freddie Hubbard, I could go on but you get the picture. 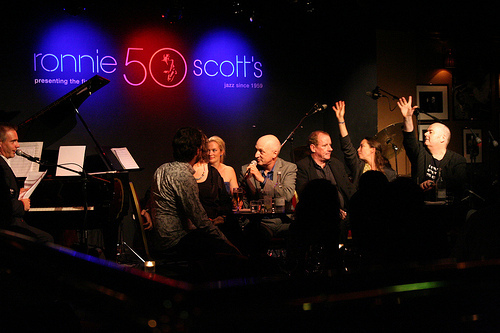 The exchange put Ronnie’s on the map and London Jazz has never been the same. Due to the success of the club, it moved to larger premises on Frith Street in the hot summer of 1965. It now had a seating capacity of 250, an upstairs room which has now been converted to ‘Ronnie’s Bar’ and a downstairs bar. It was taken over by Pete King who ran the club for 9 years following Scott’s death. Fully refurbished and still jazzed out, the current incarnation still makes this one of the ‘must experience’ clubs of all time. It hosts some of the biggest names on the international jazz scene and never fails to live up to its name. Having started out my jazz listening career there, I’ve always been impressed by the grandeur of it at times. Invitations by friendly musicians didn’t go a miss either as getting to know the club from the inside out was a lot more telling. The walls are covered by the history of the place with portraits and head shots of the immense talent that has played there. Entering the club was a little intimidating at times but once you’re in, you know you’re there for the duration and you want to stay all night. Lucky it’s open till 3am.